I grew up never ever eating the skin of a sweet potato, but now I’m a big fan of its earthy flavor and chewy texture when roasted. This is a simple, healthy crowd pleaser that appeals to children as well as adults. These wedges are great for lunch with a green salad or as a side at a picnic or outdoor barbecue because they travel well and are tasty at room temperature. Preheat the oven to 400 degrees. 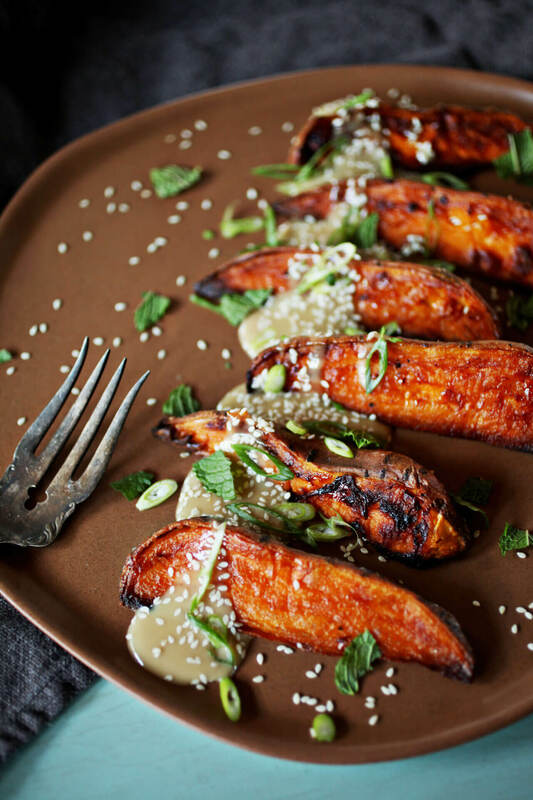 In a medium mixing bowl, toss the sweet potato wedges with olive oil and 1 teaspoon of the salt. Arrange them on a baking sheet flesh side down so that they are not touching. Slide baking sheet onto the middle rack of the oven. Roast for 20 minutes. Take the potatoes out and flip so that the opposite side touches the baking sheet. Roast an additional 20 minutes. The potatoes should be brown, crisp on all sides and creamy in the center. As they roast, whisk together the tahini, honey, lemon juice, sesame oil and remaining 1/4 teaspoon salt in a small mixing bowl. When the potatoes are done, lay them in a single layer on a serving platter and drizzle them liberally with the tahini mixture. Sprinkle with the sesame seeds. Serve at room temperature. Optional garnishes that add color and dimension to this dish are fresh cilantro, sliced scallion, parsley or mint.